Google has recently been rolling out improvements to the Play Store that make it easier to find and manage beta apps, so if you’re eager to try out some cutting edge features and are prepared to put up with a few additional bugs, there’s never been a better time to get started. Here are 12 apps worth checking out. 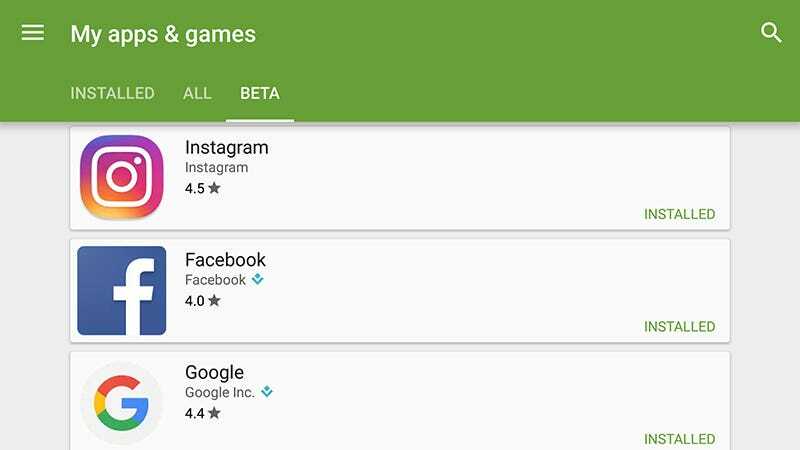 There’s no beta category or tag in the Google Play Store yet, so to find out if any of your current apps have beta versions available you need to tap My apps & games in the Play Store app menu, then select an app. Scroll down to the foot of the listing to check if a beta test is available (even if it is, it might be full). Tap I’m in if you want to take the plunge, and the beta edition will shortly be queued up as as download (go back to the same page and tap Leave if you ever change your mind). Once you’re signed up for a few betas, it is then easy to find them. There’s a Beta tab on the My apps & games screen. Just how aggressively developers beta test new features varies from app to app, of course, but you should find yourself with a few extra goodies to play around with and perhaps a preview of an interface update too. If you’re in a beta program, you’ll see “beta” next to the app titles when you search for them on the Play Store website or inside the app. There is another section of the Play Store called Early Access, which you can find as one of the green bubble headings inside the Play Store app interface. Tap on this to see unreleased games that you can preview and test free of charge, though these are likely to be more rough around the edges than the beta apps. Beta editions for all these apps can be find from inside the stable app in Google Play. In some cases, betas are available as separate downloads on the Android app store, so you can run both versions of the app alongside each other—see Chrome, Firefox, Wikipedia, VLC Player and SwiftKey, for example.